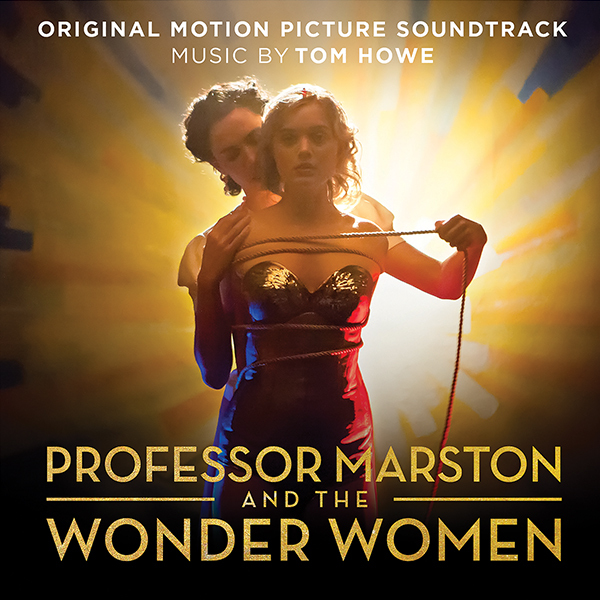 Director Angela Robinson had this to say about the score, "I was lucky enough to start working with Tom Howe in pre-production of PROFESSOR MARSTON AND THE WONDER WOMEN. Often the composer does not get involved with the film until after you've completed the final cut, but Tom was integral from the beginning. He wrote several Marston themes that I listened to while I was shooting so that his score became part of the actual filming of principal photography. I told Tom that I wanted the score to accomplish the same task the filmmaking was doing -- I wanted to tell a lush, romantic, beautiful story but with this unconventional subject matter and I wanted the score to do the same -- to be beautiful and emotional and elegant but also to simultaneously subvert itself. We settled on using a variety of percussive elements in the score which culminated in Tom integrating clapping and the sounds of actual spanking in the score to infuse the lyricism with a daring, subversive twist -- like the Marstons!" Tom Howe is an award-winning composer from the UK who has scored over 70 Emmy and BAFTA-winning dramas and documentaries, such as The Liquid Bomb Plot, Autopsy, The Vatican Saints, and Finding Jesus. After establishing himself in the UK, Tom moved to Hollywood where he wrote additional music for several major motion pictures, including the worldwide hit Wonder Woman, Disney’s Monkey Kingdom and Fox’s Exodus: Gods and Kings. Tom has recently completed work on animated film Charming from the producers of Shrek, and is currently scoring the Aardman Animation film Early Man.